Laundry detergents make it easier to remove dirt, stains, and germs from our clothes in just a jiffy. They’re some of the household products that we can rely on to make household chores convenient. Detergents, however, contain chemicals that could be toxic to our health. The plastic container it comes from also adds up to the mounting plastic landfill that is hazardous to the environment and to other living things. We can’t run away from doing our laundry but we can substitute the detergents we use for washing our clothes. If you want to know other ways to do so without resorting to laundry detergents, check out our list below. Baking soda does a great job of brightening your whites and colors and will make your clothes look newer. This product can neutralize the acid, no matter whether it came from batteries, drain cleaner, vomit, or urine, and it prevents damage to your washing machine. Any odors in your clothes will wash right out when you use baking soda. This works on bathing suits, gym clothes, and musty towels. Using baking soda with bleach is a wonderful way to improve how potent the bleach is so that you don’t have to use as much of the product. Old linens are often stained, but baking soda can easily remove some of these stains without damaging the fabric at the same time. While commercial fabric softeners rely on harsh chemicals to soften clothing, baking soda will do the same thing without damaging sensitive skin. Families with small children will love that baking soda is able to remove crayon stains from some types of fabric. You do have to wash the laundry in incredibly hot water and use half of a box of baking soda to attempt this, however. This product is able to easily get rid of any organic or dirt stains without resorting to toxic chemicals. You don’t have to worry about the color of clothing fading when you use powdered oxygen bleach. Even delicate items can be washed with this product. Powdered oxygen bleach acts as a disinfectant on any viruses or bacteria that may be living in the fabric being washed. It also does a great job of brightening whites and dull clothing without using chemicals. This product is non-toxic to humans, animals, and plants. This is great for busy parents who want to make sure that their children will be safe around whatever products they use. This bleach can also remove old stains that have been washed and dried. While other products can’t easily remove set-in stains, powdered oxygen bleach is often able to. Due to it being oxygen-based, this product won’t be as hard on your fabrics as other, chlorine-based beaches, are. Borax does an incredible job of removing stains and smells. 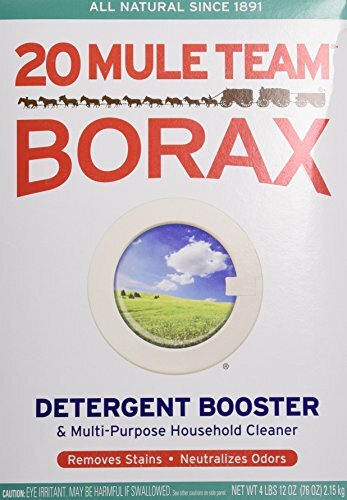 If you have urine on your clothing then you will love that Borax will remove the urine odor, leaving your clothes smelling amazing and clean. 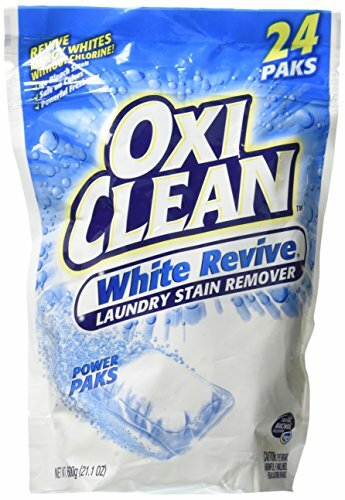 This product has a scrubbing powder that is great for helping to clean your whites and make sure that they are as white and as bright as possible. Because Borax has multiple uses, you can buy a huge box and use it in other areas of your home, as well as in your laundry. Borax has a very high pH. This means that when you add it to water it will create a slightly alkaline water for your clothes to be washed in. This is ideal for cleaning and will ensure that you get the deepest clean possible from your laundry. Any mold or fungus that is growing in your washing machine will be neutralized by Borax. If you have hard water then you will love that Borax can actually soften it. Because it contains sodium, Borax will naturally soften your water, which will improve your laundry and make sure that your clothes are as clean as possible. Any soap residue that was left in your clothing from before will immediately wash out when you use Borax, and this product will help prevent soap residue from staying in your clothing in the future. If you have clothing that is really stained or dingy, then you can rely on lemon juice to help make your whites bright again. The acid that is in lemon juice doesn’t just brighten up your whites, it is also perfectly safe for you to use on your colors, as well. Any rust stains on your clothing can be tackled and removed by lemon juice. While other stain removers can’t touch rust, lemon juice is able to easily remove it when you apply it right away and then toss it in the wash. Unlike regular detergent, which isn’t great for removing mildew and mold from clothing or curtains, you can make a paste with lemon juice and salt to treat the problem. When combined, lemon juice and salt will quickly kill the spores and can be washed out in hot water for a great finish. Not only can lemon juice easily tackle rust, but it’s also great for getting juice stains out of your clothing. Your clothes will be brighter and whiter than before you washed them when you use vinegar in your machine. This is because vinegar has a mild acid in it that will tackle stains and dingy clothing and clean them. Vinegar does a great job of removing any residue from your dark clothing. This means that if you have washed your black clothing in detergent before and have residue that makes it look dull, then you can rely on vinegar to improve the appearance of your clothing. Any mildew that is growing in your damp clothing will be removed quickly by vinegar. Pet owners will love that they can use vinegar in their wash to help keep pet hair and lint from sticking to clothing. Vinegar is great at removing smoke smells from your clothing and from your sheets and drapes. Sour smells and mold can be treated with vinegar and the smells removed. Vinegar will naturally soften your clothing and won’t leave any residue on your laundry that other products will. Not only does vinegar work hard to clean your clothes, it will also clean your washing machine. It does this by removing mineral deposits and soap scum. Because soap nuts are non-toxic and natural, you don’t have to worry about them bothering your skin or exacerbating problems that you have. This makes them great for people who have sensitive skin or skin problems. They produce a very gentle detergent that makes them safe to use on delicate items. Soap nuts won’t exacerbate your allergies. You can use your soap nuts for a few washes before they will stop working. After your soap nuts stop working, they are compostable, which means that there won’t be any waste with this product. There aren’t any synthetic chemicals in soap nuts. This means that if you have a certain chemical that you have to avoid, you can still use this product without fear. When hand washing clothes, choose a gentle shampoo like baby shampoo. Do not use a combination shampoo and conditioner or one that tints hair. Use only one teaspoon for a bathroom sink full of water. Use more for a larger sink or several items. The laundry soaps or regular bath bars can be used for hand washing clothes by shaving a bit into hot water to melt or by rubbing key soiled areas with the bar. Choose bars that do not contain oils or skin softeners to prevent spotting. As with the recommendations for shampoo, use only a small amount and choose a wash without added moisturizers. Do not forget to only use body wash when handwashing your clothes and not when you will use a washing machine. In a real pinch, reach for the hand dishwashing liquid only if you will handwash your clothes. Use the smallest amount possible and double check that the formula does not contain bleaching agents. A pack of Aquaball consists of two balls, each of which is capable of doing up to 60 washes. You simply need to add this ball to the water collected in the washing machine. The Aquaball deep-cleans your laundry without damaging the fabrics and leaves the pieces soft, fresh and clean. Though washing soda or soda crystal (scientific name: sodium carbonate) is related to baking soda, this one is much stronger. Washing soda is used to remove stubborn stains due to its high alkaline compound. To effectively maximize its potential, use it as a pre-soak laundry by mixing two spoonfuls of washing soda in a gallon of warm water before adding the clothes with a stain. Make a vodka solution consisting of one part water and one part vodka into a spray bottle. Spritz the vodka solution to your clothes and hang them out to air dry. Vodka will disinfect your clothes without leaving any musty or alcohol scent behind. Preferably applied to clothes that just need to be freshened. 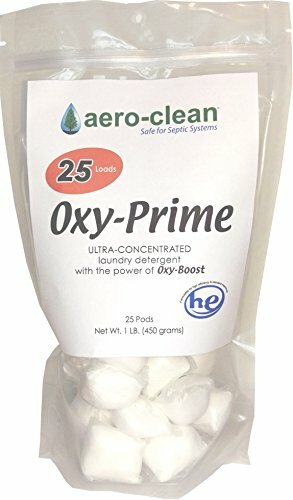 OXY-Prime is a non-toxic environment-friendly laundry detergent that cleans clothes and removes stains and spots. It’s great for all types of fabrics, including whites, pastels, bright colors, printed fabrics, and permanent press fabrics.